I loved Julie and Julia, both the book and the movie. Author Julie Powell found salvation in her year of blogging and cooking her way through Julia Child’s infamous French cookbook. Her bitingly snarky voice made me laugh. She inspired me to pursue my own passion for writing and cooking. Laden with meat, butter and cheese, almost all French cuisine is out for a vegan (aside from ratatouille). So when I saw this recipe for Quorn Bourguignon by Ann Ambrose in Vegetarian Times, inspired by Julia Child’s recipe, I knew I had to try it. 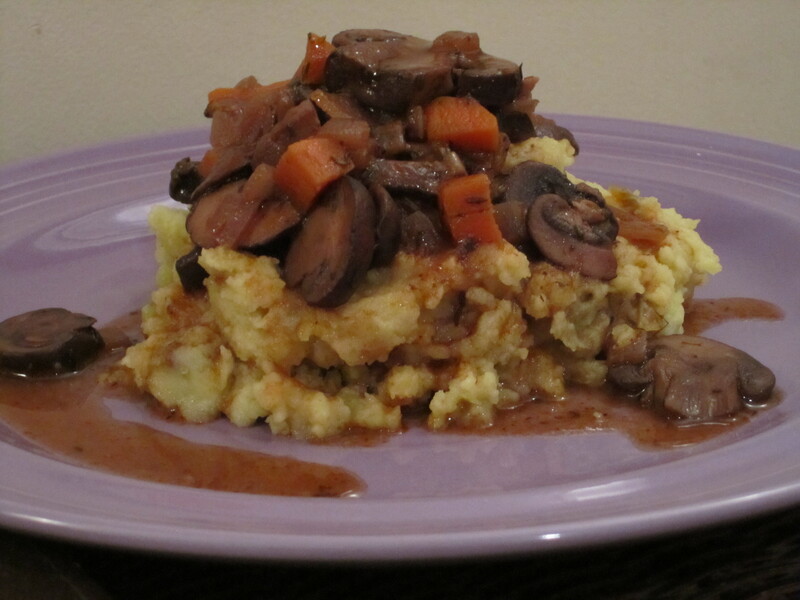 A traditional French stew, Beef Bourguignon is a former peasant dish now elevated to haute cuisine. It involves a laborious process of simmering meat accompanied by onions and mushrooms swimming in an assload of red wine. Ambrose substituted vegetable broth for beef stock and Quorn “chicken” tenders for beef. I usually abhor mock meats in recipes so I just left it out and added more veggies. Ambrose’s recipe kept Child’s ingredients of earthy mushrooms, robust red wine, crunchy carrots, pungent onions and garlic, punctuated with lemon-peppery thyme. Um, wine AND mushrooms?? Sign me up! Most people serve this decadent meal with hearty pasta. But I prefer to pour it over creamy mashed potatoes, letting the broth smother every inch. Any way you serve it, savor the rich, bold flavors transporting you to the French countryside. 1. Heat 1 tablespoon of olive oil and 1 tablespoon of vegan butter in a large saucepan over high heat. 2. Add mushrooms and saute for approximately 4 minutes until golden. Remove from pan and set aside. 3. On medium heat, add 1 tablespoon of olive oil along with carrots, onions and thyme. Season with salt and pepper (approximately 1/2 teaspoon each). Saute for about 10 minutes. 4. Add garlic and cook for 1 minute. 5. Pour in wine and increase heat to high. Simmer for 5 minutes until liquid is reduced by half. 6, Add mushrooms, broth and tomato paste. Reduce heat to medium-low and simmer for 20 minutes. 7. In a separate small saucepan, combine 1 tablespoon vegan butter with flour on high heat to make a roux. Whisk for a minute. 8. Add roux to mushroom/wine mixture. Simmer for another 10 minutes. 9. Season with salt and pepper. Serve over mashed potatoes. Tags: French cuisine, Julia Child, Julie Powell, Vegetarian Times. Bookmark the permalink. This looks very good. The link to this on Twitter was not working so I had to copy and paste the URL.